Western blot analysis of extracts from HEK293 and HeLa cells, untreated or lamda phosphatase-treated, using Phospho-Filamin A (Ser2152) Antibody (upper) and Filamin A Antibody #4762 (lower). 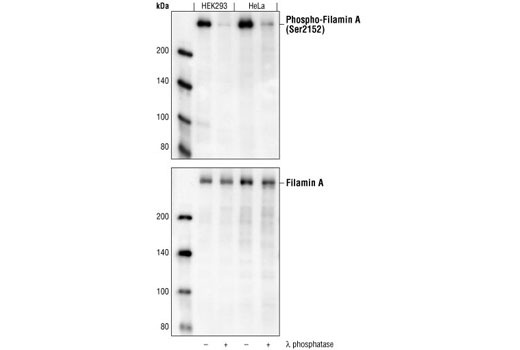 Phospho-Filamin A (Ser2152) Antibody detects endogenous levels of filamin A only when phosphorylated at serine 2152. This antibody also reacts with filamin C when it is phosphorylated at serine 2146. Polyclonal antibodies are produced by immunizing animals with synthetic phosphopeptides corresponding to residues surrounding Ser2152 of human filamin A and Ser2146 of human filamin C. Antibodies are purified by protein A and peptide affinity chromatography.